Get ready for an interesting bee season! All the way back in the summer of 1997 we had a noticeable spike in questions at DrGreene.com about severe mosquito bite reactions and severe headaches, most of them coming from Orange County, Florida. I wondered if there might be a new mosquito-borne encephalitis epidemic brewing there. I called the public health department in Orange County, all the way across the country, to alert them what we were seeing, and they dismissed my concerns, responding that they had seen nothing of the sort. But the questions to DrGreene.com kept coming. So the next week I called the CDC in Atlanta to suggest there might be a cluster of mosquito-borne encephalitis in Florida. They hadn’t heard of anything, but promised to look into it. They called back a few days later and said nothing had showed up, but they would keep paying attention. Two weeks later the mosquito-borne encephalitis in Orange County was headline news. Vacationers cancelled their trips. Part of Walt Disney World was closed because of the encephalitis. This year we’ve been getting a decidedly unusual spike in questions at DrGreene.com about bee stings. “My daughter was stung by a bee on her upper arm on the under side 8 days ago. She woke up this morning…and the sting site is red and swollen…. Increased allergies? Perhaps, but I don’t think that’s the whole story. Bee colony collapse disorder has been making headlines. Since it appeared in 2006/2007 about a third of the honeybee colonies have been disappearing every winter. [i] Millions of colonies have been lost, and the bee population is down dramatically. Our colleague Alex (Chensheng) Lu at the Harvard School of Public Health has demonstrated that sub-lethal exposure to neurotoxic neonictotinoid pesticides applied to our crops is the likely culprit. [ii] Bees carry pollen tainted with these pesticides back to their hives at less than 100 parts part billion – but enough to devastate the hive later in their cycle. (Note: if corn kernels are soaked in these pesticides before planting, and the pesticides are present in the adult plants when the bees are pollinating them, one wonders what these pesticides might have been doing to the neural development of our kids). With the bees in rapid decline, I suspect that a change in their venom has been an adaptive response, in an attempt to more aggressively defend their colonies. In the past, toxic reactions to bee venom have been uncommon – and usually occur after several bees sting someone simultaneously. This can produce severe symptoms, including intense pain, chills, fever, diarrhea, vomiting and more. Multiple stings are also more likely to make someone become allergic to bee stings going forward – or even during the recovery of that episode. We’re now hearing, often, about single stings that are producing reactions that sound toxic – as if bee venom has become more potent. Bee stings are usually most common in the early fall. This season they seem to be happening in greater numbers earlier – but we suspect the peak is yet to come. If someone is stung I recommend removing the stinger as quickly as possible (without injecting more venom, if possible. But speed is more important than technique). I also suggest giving an anti-inflammatory and antihistamine quickly to try to blunt the over-exuberant responses we have been seeing. Other suggestions for treatment and for avoiding stings are here. These exaggerated stings may also be more allergenic. 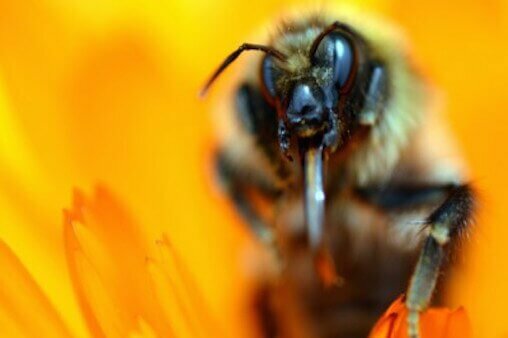 Bee stings are able to provoke severe allergic reactions. Have a very low threshold for getting help at the first sign of a problem. I hope the bees succeed in defending their species – but also hope people can avoid intense reactions to bee stings along the way. Keep your eyes open and get ready for an interesting bee season!